The Begley children are pictured in the front of the Hampden County Juvenile Court in Springfield with another batch of coats for kids in foster care. From the left: Ben, Cassidy, and Cam. MyKoats4Kids, a nonprofit organization and proponent of providing winter costs to children in foster care in the Pioneer Valley Area is seeking donations of gently used or new winter coats for children of all ages. 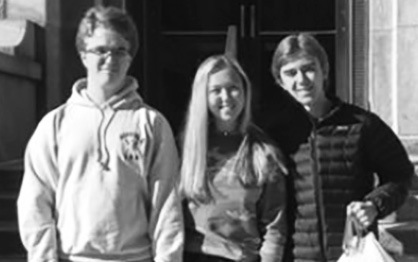 Cassidy, Ben and Cam Begley, siblings and students at Suffield High School, started the organization in 2017. The family has collected over 100 coats with the goal of doubling the collection each year. The Begley family hopes to provide children in need with a warm coat for the winter. Please contact the Begley family at koats4kids@gmail.com to arrange pick up or drop off for any donations. For more information, visit MyKoatsForKids.org.